Allergies, according to the Mayo Clinic, are your body's reaction to something it perceives as foreign, such as pollen, pet dander or medication. In response to the perceived threat, your body releases histamines, which cause a chain of events that are meant to stop the foreign invader from causing harm. Unfortunately, minor allergies can cause chronic histamine release, leading to a runny nose, sneezing, itching, coughing and headaches. 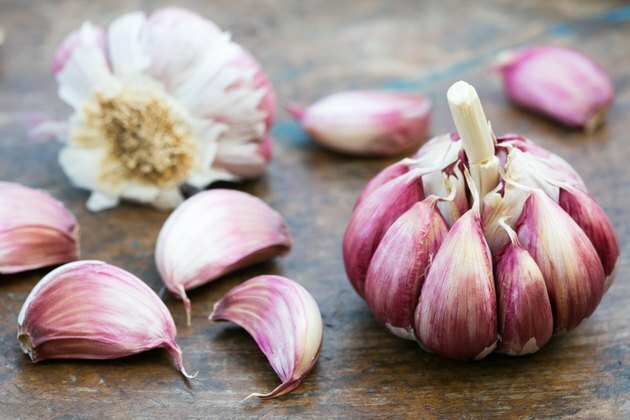 Certain allergens, like dust and pollen generally can't be avoided, but you can use natural substances like garlic to decrease or stop reacting in a way that makes you ill.
Add fresh garlic to your favorite cooked meals. According to the University of Maryland, garlic can help strengthen your immune system, making you more resistant to colds and allergens. Using fresh garlic in soups, stews, rice and pasta can help you include garlic in your diet without having to take it in capsule form. This way, you can enjoy the maximum health benefits fresh garlic provides. Use dried flaked or powdered garlic instead of salt or sodium-based seasonings. Sprinkle garlic over salads or on top of pizza. Use garlic to marinate your favorite cut of meat, along with a bit of teriyaki or soy seasoning. Using dried garlic in a variety of ways helps you consume it every day, helping your body's immunity improve so you can avoid the misery of allergies. Take a garlic supplement in capsule form, according to manufacturer's directions. The University of Maryland says that not all garlic supplements have the same concentration of garlic and may not share the same effectiveness. Look for a supplement that specifically contains "aged garlic," which has beneficial substances that are more easily absorbed by your body than other kinds of garlic. These sulfur-based substances have been found to help prevent cardiovascular disease and also have other health-improving benefits. Using a garlic supplement can make it easier for you to use garlic to treat your allergies, without the odor. Bake a head of garlic, cut in half and basted with olive oil, in a terra cotta garlic roaster. Baked garlic is versatile, and the heated garlic becomes soft and spreadable, for use on crackers or to make your own homemade garlic bread. Allow the garlic to cool after baking for 10 to 15 minutes at 400 degrees Fahrenheit, and squeeze the garlic bulbs to release the soft cloves. Store the cloves in a resealable container and enjoy them as a condiment or spread. Garlic has natural antibacterial and antiviral properties, and if you're worried about your breath, chew on a piece of parsley after eating garlic. Speak with your doctor before using any natural approach to treating a health condition, including allergies.